Shaping the physical environment and the patterns of traffic within it. Equipping children with the mobility skills they need to get about safely and creating incentives for children to develop those skills. Encouraging the use of sustainable modes of transport, such as walking, cycling, and public transport. Regulating air and noise pollution from transport so that vulnerable populations are appropriately protected. Policies must be developed through a collaborative process involving multiple stakeholders, including children. In addition, it is important that the effectiveness of a policy or legislative program be assessed over time. Mandate 30 km/h speed limits near schools to improve safety for children. Clarify that pedestrians and cyclists have the right-of-way and update liability laws to protect vulnerable road users. Develop a complete streets policy that mandates integrated, connected networks of streets that are safe and accessible for all. Identify funding sources for a safe and pleasant network of footpaths, cycle tracks, greenways and other non-motorized transit (NMT) facilities. Make motorcycle helmets mandatory for all passengers and child seat restraints compulsory in private vehicles. Policies developed by stakeholders from the community and agency staff that are formally adopted by municipal decision makers. The Uganda NMT Policy, adopted in 2012, aims to raise the profile of NMT; improve understanding of NMT user needs at all levels of government; and ensure that NMT is incorporated at all stages of infrastructure planning and implementation. Increase recognition of NMT modes. Provide safe infrastructure for pedestrians and cyclists. Mainstream the provision of resources for walking and cycling in financial planning. Promote the adoption of universal design standards. Case study: Complete street policies in the U.S. In the United States, the first complete street policies were developed in late 2003 in response to municipal planning trends that prioritized the needs of private motor vehicle users over all others. The term “complete streets” was coined by a America Bikes, a cycling advocacy organisation, as it was developing a new policy initiative with the goal of ensuring the same rights and safe access for all users of streets, including pedestrians, bicyclists, motorists, and public transport riders of all ages and abilities. Nationwide, a total of 1,232 policies are now in place, in all 50 states, Puerto Rico, and the District of Columbia, including 33 state governments, 77 regional planning organizations, and 955 individual municipalities. In 2014, the municipal government of Chennai, India, now known as the Greater Chennai Corporation, adopted an Non-Motorised Transport (NMT) Policy to prioritise walking and cycling and discourage the use of personal motor vehicles. The policy aims to arrest the current decline in walking and cycling by creating a safe and pleasant network of footpaths, cycle tracks, greenways and other NMT facilities. Despite a lack of safe infrastructure for non-motorized transport, one-third of all trips in the city are already made on foot and bicycle. The Corporation’s Chennai Street Design Project will ensure that these trips become safer, healthier, and more enjoyable through a redesigned urban transportation network. The Corporation will measure the effectiveness of the policy, using indicators such as walking and bicycling mode share, incidence of traffic crashes involving pedestrians and cyclists, footpath coverage, cycle track coverage, public transport mode share and private motor vehicle kilometers travelled. To achieve these goals, the policy requires that at least 60 per cent of the city’s transport budget be allocated to constructing and maintaining infrastructure for NMT. This includes wider footpaths, safe bicycle infrastructure, better designed intersections, and street furniture. The city has set ambitious goals for itself: by 2018, build safe and continuous footpaths on at least 80 per cent of all streets, increase the share of walking and cycling trips to over 40 per cent, and, most significantly, eliminate pedestrian and cyclist deaths. So far, the Greater Chennai Corporation has implemented over 50 km of high-quality footpaths. The progressive NMT Policy has inspired many national and international cities—from Chandigarh to Nairobi—to adopt similar policies. Pantheon Road in Chennai: before (left) and after (right). Reduction in the speed limit to 30 km/h within a 200 m radius of the school, along with traffic calming elements to ensure that vehicles follow the speed limit. Signs indicating school zone presence, pedestrian crossings, and speed limits will be installed to remind drivers to treat the area with special care and attention. Additional protection may include flashing beacons. School zone plans should be informed by surveys indicating the routes and NMT modes used by students. In Kenya, a government ministry speed management project (supported by Bloomberg Philanthropies, the Global Road Safety Partnership, and the World Health Organization) proposed legislation to limit speed limits around schools to 30km/h. The project also included a diverse set of strategies including enforcement training for more than 1,300 police officers. Progress reports estimate that overall speed compliance has risen from below 50 per cent to more than 70 per cent. It is also estimated that more than 100,000 children have been given greater protection as a result of the speed reduction and other measures of the project. When the legislation was eventually passed, the speed limit for school zones was increased to 50 km/h—considerably higher than the 30 km/h limit needed to create a safe environment for children. The city of Seoul believes that responding to children’s mobility needs can reduce traffic accidents and create safe and active commute. The Seoul school zone improvement project invested in a series of traffic calming measures such as dedicated walkways and limiting street parking along the children routes. The city also provided connected and safe routes between where the children live and their nurseries, schools and other facilities. Over the past 10 years, traffic fatalities among children have declined 95 percent. Setting reasonable fine levels for traffic violations. The Netherlands has a law of ‘strict liability’ to protect vulnerable road users from more powerful users. Strict liability came into force in 1992, years after the majority of the current cycle infrastructure was put into place. At the time strict liability was established, the Dutch had decades of experience building an extensive network of bicycle infrastructure in their towns and cities. Riders are also afforded some natural protection through the safety and driver awareness that comes with sharing the roads with large numbers of cyclists. Under this system, if an accident involves a motor vehicle and a non-motorized road user (pedestrian or cyclist), a flexible system of liability applies. In crashes involving vulnerable road users (cyclists and pedestrians), unless it can be clearly proven that the vulnerable road user was at fault, the “more powerful” road user is found liable by default. Under strict liability, the mere use of a motor vehicle constitutes a great risk to non-motorized road users, and automobile drivers are therefore presumed liable for this risk. Where the injured cyclist or pedestrian is younger than 14 years old, the driver is automatically 100 per cent liable. If the pedestrian or cyclist is over 14 years old, the driver is assumed to be 50 per cent liable. The amount of the compensation for the remaining 50 per cent is dependent on the degree of fault of all the parties involved. Per Dutch Civil Code, a cyclist or pedestrian can get a fine when he or she is at fault, for instance by breaking traffic rules). At the same time they will receive compensation for any injuries. All monetary losses must be compensated, and the courts are given a wide margin of discretion in assessing the amount of damages to be paid in cases of general or personal injuries. 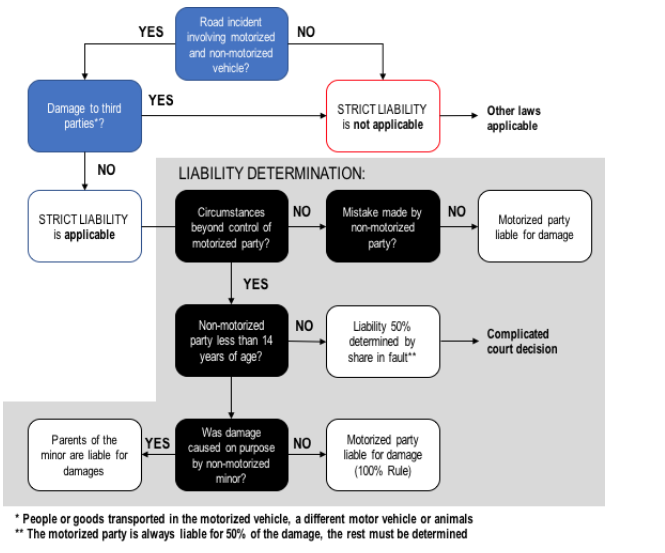 When the strict liability law is applicable, the motor vehicle user is liable for financial damages, unless that driver can prove the incident was caused by circumstances beyond his/her control. Determination of liability under Dutch law. The Netherlands is not the only jurisdiction to have strict liability. Many other European countries and states have strict liability laws, but not the same safe cycling conditions or high cycling rates. It is hard to isolate the effect strict liability has had on the overall safety of cycling, but in those nations with high rates of cycling and high levels of cycle safety, strict liability exists in a policy portfolio designed to support safe cycling. There hasn’t been much research on the isolated effects of strict liability on road safety, but anecdotal evidence indicates that at the very least, strict liability encourages drivers to become more cautious in their approach on the road. The Government of Bangladesh, the World Bank, and BRAC (known formerly as the Bangladesh Rural Advancement Committee) collaborated on an advocacy project called ‘Promoting Safe Road Code.’ This three year project (2013-2015) drafted and promoted a safe road code in consultation with relevant stakeholders and experts. The draft code described important rules and regulations which should be followed by all road users, and was incorporated into the government of Bangladesh’s new traffic laws (RTA). The project helped create an enabling environment for the road safety program. It educated communities, local and national policy makers, other authorities, and service providers, and mobilized these groups to improve road safety and support future activities of the road safety program. In cities where streets are designed for moving people, not motor vehicles, data suggest helmet laws for cyclists are unnecessary. In other contexts, helmet laws may play a role in improving road safety. Too much policy focus on helmets detracts from the larger safety issues that children and all cyclists experience on roads without protected cycle infrastructure. Helmet laws are designed to protect cyclists during crashes on unsafely designed roads, and would be unnecessary if legislation required safe roadway designs that accommodated all road users. Children who are legally permitted to ride as passengers on motorcycles should be subject to the country’s helmet laws and standards. A helmet law is only as effective as its enforcement. In 2004, the South African government passed a law making it compulsory for all bicyclists to wear helmets. The regulation requires the use of a protective helmet that is properly fastened and fitted while riding a bicycle or being carried as a passenger. However, by the end of 2005, is was observed that very few cyclists wore helmets except those participating in cycle sport. Enforcement of the law was rare and no fine had been agreed. In 2016, substantial increases in fines were proposed for not wearing a helmet, not stopping at a traffic light, and not carrying identification. Fortunately, these proposed increases were not passed. Since they were burdensome to cyclists, they easily could have had unintended consequences, reducing the cycling mode share. Like riders of motorised two-wheelers, bicyclists face a considerable risk of injury if involved in a road crash. However, there are significant arguments against adopting compulsory bicycle helmet legislation. In particular, such legislation discourages people from choosing cycling as a transport mode. In the early 1990s, a mandatory helmet law was introduced in Australia and failure to comply resulted in a fine. Across the country, cycling numbers fell, especially among teenagers. Among female secondary pupils in Sydney, cycling rates fell by 90 percent. A similar law was passed in New Zealand in 1994 and the popularity of cycling never recovered, with rates still 51 per cent lower over a decade after the legislation. Kenya’s 2009 Traffic Amendment Bill included mandatory helmet use for all motorcycle drivers and passengers. This case is especially relevant to children’s health and mobility as they are often ferried to school on motorcycles. In 2012, penalties for violating the law were increased in the Traffic Amendment Act. Observational studies indicate that despite participants’ knowledge of the benefits of helmet use, there was low helmet use and enforcement following passage of the legislation. Of the helmets observed in use, many were likely of substandard quality. With many motorcycles in Kenya used as taxis, many considered unhygienic or even prone to magic spells. As this mandatory policy is enforced, children passengers ought to be held to the same standards as adult passengers. To make this a viable policy, child-sized helmets must be affordable and widely available. Mandating and enforcing vehicle safety standards and child restraint laws for all private vehicles can improve road safety for children. Putting in place internationally recognized manufacturing standards for child restraints (such as infant car seats, child car seats, booster seats, and seat-belts depending on the age, weight and height of the child) is only an effective technique if it is partnered with targeted enforcement and public awareness strategies. Policy writing should occur collaboratively and should explicitly seek to incorporate children’s participation. Children’s health and mobility involves a diverse cross section of departments or key stakeholders (including but not limited to transportation planning, urban development, policing/public security, housing, education, public transit, and public health interests). Youth and their parents should also be included as stakeholders and be given opportunities to shape policies affecting them. A broad section of participants will help keep policies relevant and understandable, and key areas from being overlooked. Consultation with other parties also promotes consensus and accountability. Creating opportunities for children to have a voice in the planning and design process can encourage community ownership and improve the relevance of design solutions. Children can speak to their mobility needs best. A U.S. organization called Growing Up Boulder has worked to incorporate youth ideas and feedback into park design, master planning, and development plans.